Some actions in OroCommerce trigger other actions. This behaviour is pre-defined at the background and can be modified in the course of the system integration. Mostly, these actions are related to OroCommerce extensions. 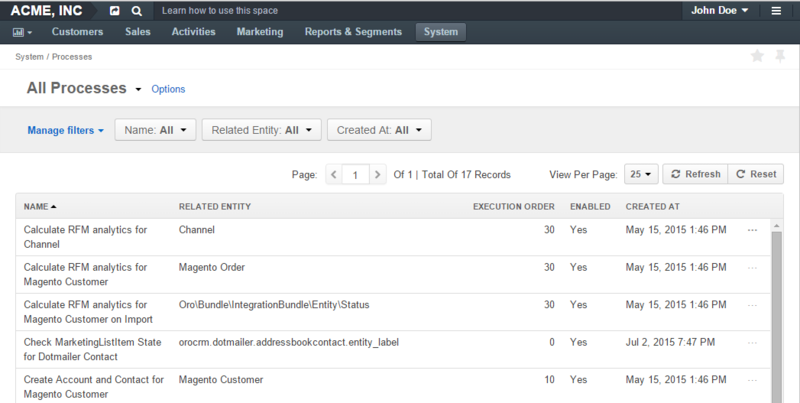 To view the processes, navigate to the System > Processes in the main menu. RELATED ENTITY Oro application entity, records of which are influenced by the process. Click the View next to the process to see the general process details and the Process Triggers, i.e. in response to what event and with what delay the process starts. To enabling/disabling the process, use the Activate and Deactivate buttons on process page or the and icons on the All Processes page.